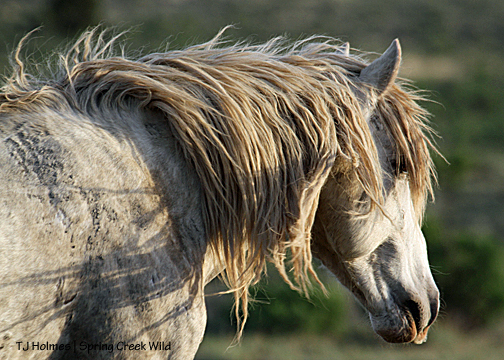 How does your donation to NMA/CO help the Spring Creek Basin mustangs? 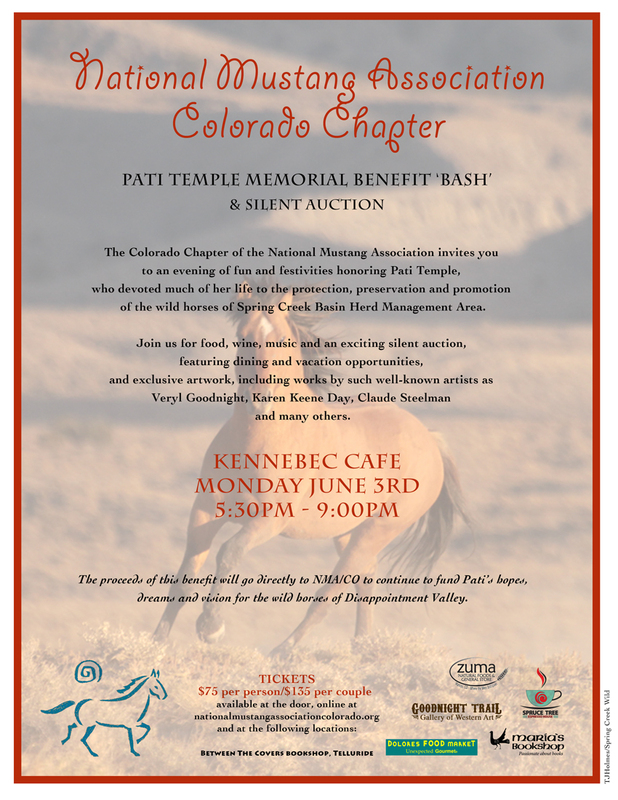 This question was asked recently, and answering it gives me another chance to let local folks know about the Pati Temple Memorial Benefit Bash we will hold next week, Monday, June 3, at the Kennebec Cafe in Hesperus, Colo. Follow that link for the details and to purchase tickets if you haven’t and plan to attend. Now, on to an answer(s) to the question! 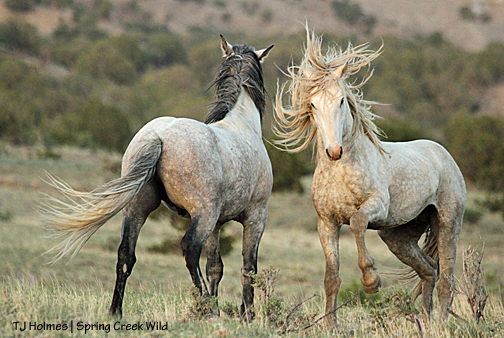 As it says, NMA/CO has spent nearly $100,000 to date on projects that directly benefit the mustangs of Spring Creek Basin! We rarely do fundraisers, relying mostly on memberships and donations. Administrative expenses are low, mostly what we put toward mailing newsletters. We had T-shirts and hats printed for the adoption in 2011, and we’ll soon have a link to purchase them through the website. Fence repair and maintenance is ongoing through volunteer labor. As a result of their partnership with us as part of Disappointment Wild Bunch Partners, BLM received $25,000 last year through the Director’s Challenge grant, which purchased some materials to be used in a project on the basin’s southeastern boundary line (read about alternative spring break and University of Missouri students’ work here – https://springcreekwild.wordpress.com/2013/03/26/alternative-spring-break-day-1/ – and here – https://springcreekwild.wordpress.com/2013/03/27/12368/). I fix fences as needed while I’m in the basin doing documentation. Sometimes we use materials provided by BLM, other times by ourselves. We also are continually encouraging BLM to look at water-enhancement projects. More than a decade ago, NMA/CO paid for a water catchment to be built in Spring Creek Basin, and it supplies the mustangs’ only clean source of water (all others being extremely alkaline, at least). We have a signed agreement from about 12 or 13 years ago with BLM to construct at least one more catchment, but it has never been built. I think the catchment cost about $10,000. 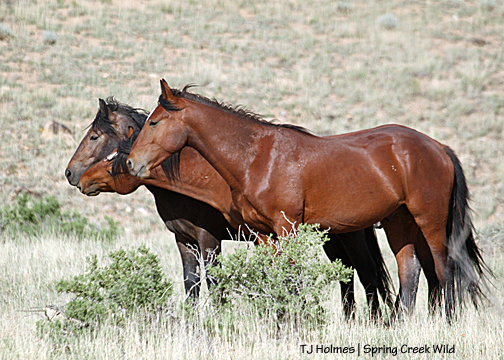 Several years ago, we also started talking to BLM about water guzzlers (such as those installed on Pryor Mountain Wild Horse Range) to add to the horses’ quality of water. Those are about $8,000-plus. NMA/CO also has purchased parts for the catchment’s troughs, which work on floats. NMA/CO contributes funds to combat noxious/invasive weeds in Spring Creek Basin (knapweed, tamarisk, musk thistle, etc.). A decade or more ago, NMA/CO was able to purchase the cattle AUMs from one of the two ranchers who held permits in Spring Creek Basin. With the help of the National Mustang Association, we were able to retire those AUMs permanently. In the process, BLM conducted a grazing EA (not sure the exact reference) and then drastically reduced the remaining AUMs and changed the timing to dormant-season grazing only – Dec. 1 through Feb. 28. For the last several years, NMA/CO has been trying to buy or trade for the permit in Spring Creek Basin to also retire those AUMs, with the goal of no cattle grazing in the basin. 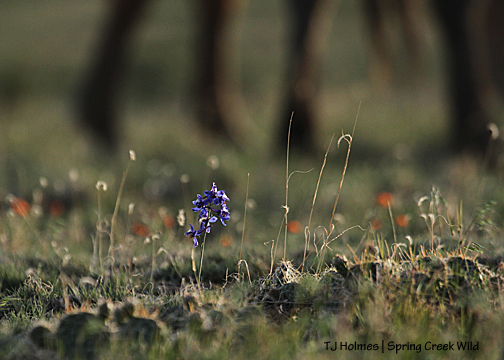 As BLM itself says, managing wild horses is easier when the mustangs are the priority. 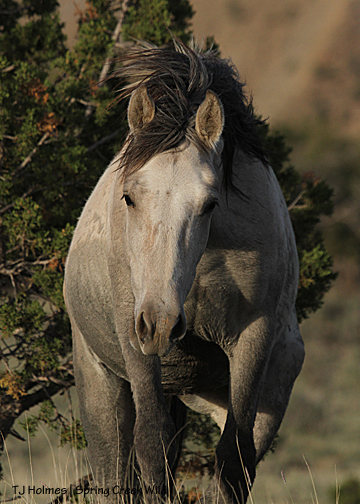 The permittee is willing, so we are trying to work with BLM to accomplish this goal. NMA/CO also is asking BLM to consider the use of bait trapping in the basin, instead of helicopter-driven roundups to complement the use of fertility control. We submitted a proposal for a program using native PZP that was implemented at the 2011 roundup. To bait trap requires the use of a facility in which to hold horses as they are trapped. This facility requires a chute and pens. We recently purchase a chute ($18,000) with donated funds from the National Mustang Association (of which we are a chapter). 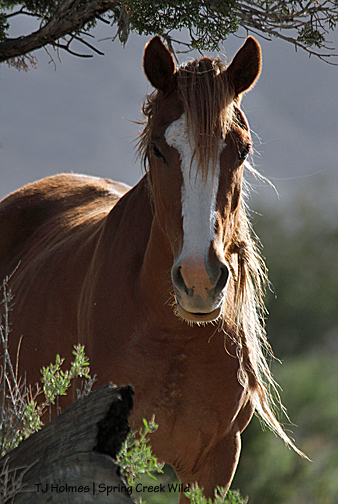 Our primary goal in fundraising currently is to purchase the required infrastructure for this facility so BLM won’t have only the option of using a helicopter and won’t need to transport one or two horses at a time – as they’re trapped – to Canon City, which is full, as most/all of BLM’s facilities seem to be. NOTE: NO ROUNDUP CURRENTLY IS PLANNED FOR SPRING CREEK BASIN. We are planning this now to have the facility in place so a future EA can include it in the planning process. As BLM said in 2011, bait trapping was not considered because it wasn’t in the EA. It wasn’t in the EA because no facility was available. However, note that we started asking specifically for bait trapping in 2008. Enhancing water sources, retiring the remaining cattle AUMs, establishing a fertility control program and making bait trapping the priority for roundups all were Pati Temple’s goals for the Spring Creek Basin herd. In addition to the accomplishments made for the mustangs during Pati’s lifetime, we plan to accomplish these goals in her honor. Something different than usual. Focus on backlit larkspur, globe mallow (orange) and grama grass with mustang legs in the background. Mysterium walks up out of a shallow arroyo while grazing with her family. Such a gorgeous girl. Happy Memorial Day. To paraphrase a quote I’ve seen: Have fun on this holiday, and remember the sacrifices of those who made it possible. Sundance watches Hollywood’s and Comanche’s bands near sunset on a windy day in Spring Creek Basin.